Looking for something to do tonight with the whole family? PIHS* (Precious In His Sight) a local non-profit, advocating for adoptive and foster families...is hosting a free concert this evening at Fellowship Baptist Church in Mt. Laurel, NJ. Come see the Watoto Children's choir, from Uganda. 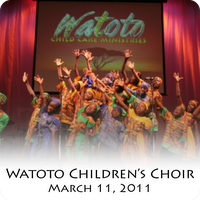 Who is the Watoto Children's Choir**? "Watoto Children’s Choirs have travelled internationally since 1994 as advocates for the estimated 50 million children in Africa, orphaned as a result of HIV/AIDS, war, poverty and disease. Issues such as poverty, HIV/AIDS, the effects of war and the child soldier crisis in Northern Ugandan are highlighted. Each of the children in the choir has suffered the loss of their parents either through war or disease. They live in Watoto children’s villages. The experience gives the children exposure to other cultures broadening their worldview. It also gives them confidence and boldness and helps them rise up out of their own situations of sadness and despair.The choirs have toured Uganda, Kenya, South Africa, Australasia, Canada, UK, Germany, France, USA, South America, Hong Kong, China and Japan.Their audiences have included princes and paupers, warming many hearts wherever they go." Again, this is a Family Friendly Free Concert...in the Philly area! Plus, you'll get the chance to help...someone else. I'm super excited, so are the kids! We had so much fun friday night!!!! Lizzy was standing on Jeff's lap trying to dance like the kids.